Farmer’s markets and backyard gardens are brimming with tomatoes, those succulent, end-of-summer treats. Enjoy the miniature red, yellow and purple tomatoes – little orbs of irresistible sweetness, slice the growing variety of heirlooms for a picture perfect buffet plate, and stash away a supply for your winter stews, soups, and sauces! 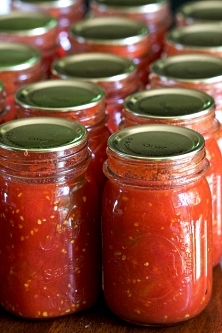 Carolyn has updated her popular and free (online) Extension publication Canning Tomatoes and Tomato Products, a rich compendium of tips, recipes for sauces and salsas, and this important checklist. Select firm, ripe tomatoes. Do not can tomatoes from dead or frost killed vines. Use amount and type of ingredients specified and prepare ingredients as directed. Acidify tomatoes with lemon juice or citric acid. Process tomatoes in a boiling water canner or pressure canner for the time specified. Examine jars for spoilage before use.